"Paleolithic art" redirects here. For disputed claims of earlier artistic expression, see Art of the Middle Paleolithic. The art of the Upper Paleolithic represents the oldest form of prehistoric art. Figurative art is present in Europe as well as in Sulawesi, Indonesia, beginning at least 35,000 years ago. Non-figurative cave paintings, consisting of hand stencils and simple geometric shapes, is at least 40,000 years old. According to a 2018 study based on uranium-thorium dating, the oldest examples of Iberian cave art were made as early as 64,000 years ago, implying Neanderthal authorship, which would qualify as art of the Middle Paleolithic. The emergence of figurative art has been interpreted as reflecting the emergence of full behavioral modernity, and is part of the defining characteristics separating the Upper Paleolithic from the Middle Paleolithic. The discovery of cave art of comparable age to the oldest European samples in Indonesia has established that similar artistic traditions existed both in eastern and in western Eurasia at 40,000 years ago. This has been taken to suggest that such an artistic tradition must in fact date to more than 50,000 years ago, and would have been spread along the southern coast of Eurasia in the original coastal migration movement. It is important to note that most of the art of this period is expected to have been lost, as it was submerged in the early Holocene sea level rise. Cave art in Europe continued to the Mesolithic (at the beginnings of the Holocene) about 12,000 years ago. European Upper Paleolithic art is also known informally as "Ice Age art", in reference to the last glacial period. In November 2018, scientists reported the discovery of the oldest known figurative art painting, over 40,000 (perhaps as old as 52,000) years old, of an unknown animal, in a cave on the Indonesian island of Borneo. Art of the European Upper Paleolithic includes rock and cave painting, jewelry, drawing, carving, engraving and sculpture in: clay, bone, antler, stone and ivory, such as the Venus figurines, and musical instruments such as flutes. Decoration was also made on functional tools, such as spear throwers, perforated batons and lamps. Engravings on flat pieces of stones are found in considerable numbers (up to 5,000 at one Spanish site) at sites with the appropriate geology, with the marks sometimes so shallow and faint that the technique involved is closer to drawing – many of these were not spotted by the earliest excavators, and found by later teams in spoil heaps. Painted plaques are less common. It is possible that they were used in rituals, or alternatively heated on a fire and wrapped as personal warmers. Either type of use may account for the many broken examples, often with the fragments dispersed over some distance (up to 30 metres apart at Gönnersdorf). Many sites have large quantities of flat stones apparently used as flooring, with only a minority decorated. Some of the oldest works of art were found in the Schwäbische Alb, Baden-Württemberg, Germany. 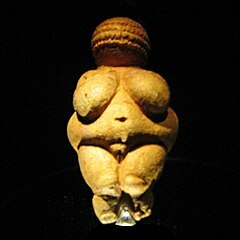 The Venus figurine known as the Venus of Hohle Fels, dates to some 40,000 years ago. The so-called Adorant from the Geißenklösterle cave dates to about the same time. Other fine examples of art from the Upper Palaeolithic (broadly 40,000 to 10,000 years ago) includes: cave painting (such as at Chauvet, Lascaux, Altamira, Cosquer, and Pech Merle), incised / engraved cave art such as at Creswell Crags, portable art (such as animal carvings and sculptures like the Venus of Willendorf), and open-air art (such as the rock art of the Côa Valley and Mazouco [it] in Portugal; Domingo García and Siega Verde in Spain; and Fornols-Haut [fr] in France). There are numerous carved or engraved pieces of bone and ivory, such as the Swimming Reindeer found in France from the Magdalenian period. These include spear throwers, including one shaped like a mammoth, and many of the type of objects called a bâton de commandement. 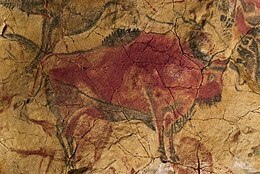 Bison painting (replica) from the Cave of Altamira, dated to the Magdalenian. The animals depicted are prey sought by the Paleolithic hunters, such as reindeer,horses,bisons,mammoth, the woolly rhinoceros, and birds,[clarification needed] as well as apex predators such as lions panthers or leopards,hyenas and bears. The human form was represented comparatively rarely (relative to the depiction of animals); most notable are the Venus figurines (representation of the female form, emphasizing breasts and/or buttocks). (they often look either: young, old, or pregnant). The Lion-man of Hohlenstein-Stadel (Aurignacian) is a hybrid creature with a lion's head on a human body. Representation of males are rare prior to incipient Mesolithic. Mesolithic examples include the "Pin Hole man" of Creswell Crags, Derbyshire. There is evidence for some craft specialization, and the transport over considerable distances of materials such as stone and, above all marine shells, much used for jewellery and probably decorating clothes. Shells from Mediterranean species have been found at Gönnersdorf, over 1,000 kilometres from the Mediterranean coast. The higher sea levels today mean that the level and nature of coastal settlements in the Upper Paleolithic are now submerged and remain unknown. Hand stencils from Leang-Leang Prehistoric Site, Maros, Sulawesi. Gabarnmung, or Nawarla Gabarnmung, is an Aboriginal archaeological and rock art site in south-western Arnhem Land, in the Top End of Australia's Northern Territory. The rock shelter features prehistoric paintings of fish, including the barramundi, wallabies, crocodiles, people and spiritual figures. Most of the paintings are located on the shelter's ceiling, but many are found on the walls and pillars of the site. The painting on the ceiling has been securely dated to before 27,000 years ago. Radiocarbon dating of charcoal excavated from the base of the lowest stratigraphic layer of the floor returned a mean age of 7004451890000000000♠45189±1089 years Cal BP suggesting the oldest date for the earliest human habitation. Faceted and use-striated hematite crayons have been recovered from nearby locations (Malakunanja II and Nauwalabila 1) in strata dated from 45,000 to 60,000 years old which suggests that the Gabarnmung shelter may have been decorated from its inception. The Bradshaws are a unique form of rock art found in Western Australia. They are predominantly human figures drawn in fine detail with accurate anatomical proportioning. They have been dated at over 17,000 years old. The oldest known figurative art from Sub-Saharan Africa are seven stone plaquettes painted with figures of animals found at the Apollo 11 Cave complex in Namibia, and dated to between 27,500 and 22,500 years ago. There is a substantial amount of rock art attributable to the Bushmen (San) found throughout Southern Africa. Much of this art is recent (as evident from the subject matter depicted, including depictions of wagons and of white settlers wearing hats), but the oldest samples have been tentatively dated to as early as 26,000 years ago. Matobo National Park, Zimbabwe, has many rock paintings. The oldest examples to 7,000 years ago, possibly as early as 13,000 years ago, while the bulk were likely produced between c. 1,700 and 1,500 years ago. Petroglyphs in North Africa such as those at Tassili n'Ajjer, Algeria, are dated to about 12,000 to 10,000 years old. Petroglyphs in West Africa are younger, such as those of Bidzar, Cameroon, dated to after 3,000 years ago. The Americas were first reached at the very end of the Last Glacial Maximum. The oldest known art from the Americas dates to the beginning Holocene. Thus, the rock paintings in the Toquepala Caves in southern Peru are dated at ca. 11,500 years ago. Some of the paintings are figurative, notably including a scene of armed men hunting guanaco cameloids. The men are in a posture of attacking the animals with axe, lances, and spear throwers (but not including bow and arrow). The paintings are polychrome, with red made from hematite being the dominant color. Early burial sites in Peru, such as the one at Telarmachay dating from about 10 ka onward, contained evidence of ritual burial, with deposits of red ocher and bead necklaces marking the site. ^ a b M. Aubert et al. (2014): "two figurative animal depictions from seven cave sites in the Maros karsts of Sulawesi, we show that rock art traditions on this Indonesian island are at least compatible in age with the oldest European art. [...] Among the implications, it can now be demonstrated that humans were producing rock art by ∼40 kyr ago at opposite ends of the Pleistocene Eurasian world." ^ D. L. Hoffmann; C. D. Standish; M. García-Diez; P. B. Pettitt; J. A. Milton; J. Zilhão; J. J. Alcolea-González; P. Cantalejo-Duarte; H. Collado; R. de Balbín; M. Lorblanchet; J. Ramos-Muñoz; G.-Ch. Weniger; A. W. G. Pike (2018). "U-Th dating of carbonate crusts reveals Neandertal origin of Iberian cave art". Science. 359 (6378): 912–915. doi:10.1126/science.aap7778. PMID 29472483. "we present dating results for three sites in Spain that show that cave art emerged in Iberia substantially earlier than previously thought. Uranium-thorium (U-Th) dates on carbonate crusts overlying paintings provide minimum ages for a red linear motif in La Pasiega (Cantabria), a hand stencil in Maltravieso (Extremadura), and red-painted speleothems in Ardales (Andalucía). Collectively, these results show that cave art in Iberia is older than 64.8 thousand years (ka). This cave art is the earliest dated so far and predates, by at least 20 ka, the arrival of modern humans in Europe, which implies Neandertal authorship." ^ Bar-Yosef, Ofer (2002). "The Upper Paleolithic Revolution". Annual Review of Anthropology. 31: 363–393. doi:10.1146/annurev.anthro.31.040402.085416. ^ "Mind: What archaeology can tell us about the origins of human cognition". Vub.ac.be. Retrieved 23 September 2013. ^ The term is attributed to Björn Kurtén: "as we look at Ice Age art, there will always remain an element of mystery and elusive" (B. S. John, The ice age: past and present, 1977, p. 220. ^ a b Zimmer, Carl (7 November 2018). "In Cave in Borneo Jungle, Scientists Find Oldest Figurative Painting in the World - A cave drawing in Borneo is at least 40,000 years old, raising intriguing questions about creativity in ancient societies". The New York Times. Retrieved 8 November 2018. ^ a b Aubert, M.; et al. (7 November 2018). "Palaeolithic cave art in Borneo". Nature. Retrieved 8 November 2018. ^ "Antiquity – Cambridge Core". antiquity.ac.uk. ^ Vanhaeren, Marian; d'Errico, Francesco (June 2005). "Grave goods from the Saint-Germain-la-Rivière burial: Evidence for social inequality in the Upper Palaeolithic". Journal of Anthropological Archaeology. 24 (2): 117–134. doi:10.1016/j.jaa.2005.01.001. ^ "British Museum – perforated baton". British Museum. ^ "British Museum – laurel leaf point". British Museum. ^ Maugh II, Thomas H. (14 May 2009). "Venus figurine sheds light on origins of art by early humans". Los Angeles Times. Archived from the original on 15 May 2009. Retrieved 14 May 2009. ^ Pettitt, P. (2003). "Discovery, nature and preliminary thoughts about Britain's first cave art" (PDF). Archived from the original (PDF) on 2012-04-25. ^ "British Museum – spear-thrower". British Museum. ^ e.g. the Solutrean horse figurine from Vogelherd Cave, "Wild Horse". Archived from the original on 2013-01-20. ^ Bison figurine from Vogelherd Cave, "Bison". Archived from the original on 2013-01-20. ^ "Mammoth". Archived from the original on 2013-01-20. ^ "The State Hermitage Museum: Collection Highlights". Archived from the original on 2012-09-07. Retrieved 2012-10-23. ^ "Lion's Head". Archived from the original on 2013-01-20. ^ "Snow Leopard". Archived from the original on 2013-01-21. ^ "The State Hermitage Museum: Collection Highlights". ^ M. Aubert et al., "Pleistocene cave art from Sulawesi, Indonesia", Nature volume 514, pages 223–227 (09 October 2014) "using uranium-series dating of coralloid speleothems directly associated with 12 human hand stencils and two figurative animal depictions from seven cave sites in the Maros karsts of Sulawesi, we show that rock art traditions on this Indonesian island are at least compatible in age with the oldest European art. The earliest dated image from Maros, with a minimum age of 39.9 kyr, is now the oldest known hand stencil in the world. In addition, a painting of a babirusa ('pig-deer') made at least 35.4 kyr ago is among the earliest dated figurative depictions worldwide, if not the earliest one. Among the implications, it can now be demonstrated that humans were producing rock art by ∼40 kyr ago at opposite ends of the Pleistocene Eurasian world." ^ A slab of painted rock which fell to the floor had ash adhering which was radiocarbon dated at 7004276310000000000♠27631±717 years Cal BP which indicates that the ceiling must have been painted before this time. ^ Delannoy, Jean‑Jacques (2015). "The social construction of caves and rockshelters: Chauvet Cave (France) and Nawarla Gabarnmang (Australia)". Antiquity. 87 (335): 12–29. doi:10.1017/S0003598X00048596. .
^ Shaw, Ian; Jameson, Robert (2002). A Dictionary of Archaeology. Wiley-Blackwell. p. 640. ISBN 978-0-631-23583-5. ^ Anne I. Thackeray , "Dating the Rock Art of Southern Africa", New Approaches to Southern African Rock Art Vol. 4, (Jun., 1983), pp. 21-26. 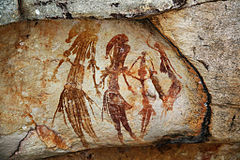 ^ Zimbabwe (africanrockart.org), Unesco World Heritage nr. 306. ^ David S. Whitley (2001). Handbook of Rock Art Research. Rowman & Littlefield. pp. 712–. ISBN 978-0-7425-0256-7. . "Field Museum of Natural History Bulletin". Archive organization. Retrieved 6 July 2013. Bahn, Paul G; Vertut, Jean (1997). Journey Through the Ice Age. University of California Press. ISBN 978-0-520-21306-7. Portal, Jane (2000). Korea: Art and Archaeology. Thames & Hudson. ISBN 978-0-7141-1487-3. Thackeray, Anne I.; Thackeray, JF; Beaumont, PB; Vogel, JC; et al. (2 October 1981). "Dated Rock Engravings from Wonderwerk Cave, South Africa". Science. 214 (4516): 64–67. doi:10.1126/science.214.4516.64. PMID 17802575. Cook, Jill (2013). Ice Age art: the arrival of the modern mind. The British Museum Press. ISBN 978 0 7141 2333 2. "British Museum – Ice Age art: arrival of the modern mind". British Museum.